This shawl collar pullover is a great addition to your sweater collection and knits up so quickly. 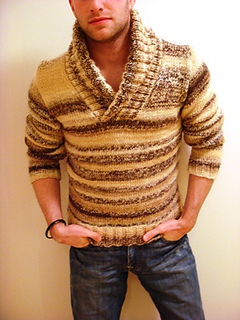 Knit it with a self striping yarn to give it a little something extra or use a solid yarn for a more classic feel. 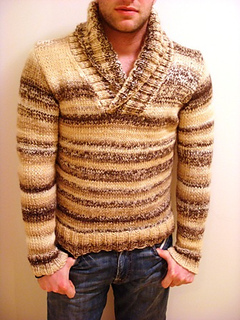 The pictured sweater is knit flat to make the striping wider, but it can easily be knit in the round for smaller stripes and solid colors. The yarn is held doubled so you could always use 2 different colors or even use one yarn that gets the gauge. It’s a perfect pullover to throw on to go out to run errands or have a drink with friends. The big shawl collar is easy to pull on and off your head for those of you that are worried about messing up your hair.